I've previously posted some of my jewelry designs that I made using a program that I'm writing in OpenSCAD and that I printed on my UM2GO. I've printed over 60 of them in PLA so far. This is the first one I've converted to metal. It was cast using the lost wax casting process, but using a 3D print instead of hand-carved wax. 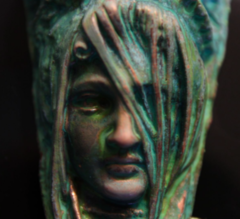 Although I have done several successful casts using PLA (like the bronze bust in my profile pic), I decided to use castable resin for this piece. This resin has several advantages over PLA for casting. I have access to a Form 2 printer and casting equipment at the local community college, and I used them to print and cast this piece. After casting this pendant in sterling silver, I used liver of sulfur to give it an antique-looking patina and increase the contrast. It is 45 mm long (about 1 7/8 inches), and contains more than an ounce of silver. The second photo shows the pendant with the original PLA prototype printed on my UM2GO. I like to print the prototypes bigger to make it easier to see the details in the design. I've made over 100 pieces of jewelry in the past 4 years, using a wide variety of materials and methods. This is my favorite so far. This is the first of a series that I think I'm going to call "Fossils of Planet Phaeton". It looks nice and sharp on the edges which i always look for in smooth looking models. I always wanted to cast metal but i want larger stuff and i want it perfect. Is that possible without a pressure mold or vacuum? And just a cheap home setup? I don't know for silver, but on Youtube you find lots of videos of people casting aluminum in a relatively cheap home setup. Very interesting. It takes a gas burner, a furnace, a wood box, special casting sand, and a few spoons. And of course fire-resistant safety wear: helmet with face mask, body covering suit, thick gloves, shoes: this is probably the most expensive. So that you won't get hurt if the hot metal would explode like a volcano, due to steam formation if you accidentally pour it into a wet mould. And then you only need gas (acetylene?) and scrap aluminum. And a garden and reasonably good weather (not too wet). Maybe the last one is the most difficult to order here in Western Europe. The weather in europe... yes to darn cold for a lot of procesess. But my only problem with all the alu tutorials is the surface of the models is pitted rather than smooth. It is possible. I cast this piece using a centrifugal casting machine because it is small, and it takes some force to get the metal to fill the mold completely. Larger pieces are easier. I've cast larger pieces in bronze without any special casting equipment. You will of course need some sort of kiln to burn out the wax or PLA and a way to melt the metal. I used plaster investment, and there are always some surface imperfections that you need to file and sand when you use plaster. Ceramic shell investment gives a better surface. Interesting i need to look into this further. How much is a centrifugal device? And how would i go about making a ceramic mould? How much is the cost of a ceramic mold of day 20cmx20cmx20cm, Roughly? Centrifugal casting machines are the most common kind used by jewelers and they can give very good results. There is a wide price range. Here's a link to a relatively inexpensive spring-driven casting machine. It can handle flasks up to 4" x 6" (102 x 152mm), although the flask that is included with the machine is smaller (90 x 102mm). The wax or PLA model shouldn't be any closer than 12mm from the sides and bottom of the flask, and 25mm from the top, so that limits the size of the pieces you can cast. This machine doesn't include a shroud so you will need to buy or make one. It is unlikely to fail, but if it does, you don't want it to throw molten metal on you. Here's a link to a better (and more expensive) Neycraft Spincaster. There is a link to video on this page that shows how to use it. There are other machines that are much more expensive that have electric motors rather than springs, but they don't give significantly better results. I've seen casting into ceramic molds, but haven't done it myself. It's more expensive than plaster, but I don't think that it is a lot more expensive. It is a more time-consuming process than plaster, and is typically used for larger sculptures. Ceramic shells can't be used in a centrifugal caster, and they are rarely used by jewelers. Here is a link to an overview of the ceramic shell process. For best results, don't use ordinary plaster of Paris. Use a plaster that is formulated for investment. The biggest problem with plaster is air bubbles. There are vacuum systems that can remove the air bubbles from the plaster. I find that it helps to paint the plaster onto the model with a small paintbrush before embedding it in the plaster. This helps to avoid getting air bubbles on the surface of the model, which causes pimples on the surface of the metal. The issue with PLA is that it expands before it burns out. This can crack the plaster or ceramic investment and cause the cast to fail. To avoid this, you can paint a thin coat of shellac on the PLA before investing it. The shellac burns off quickly, leaving a little space for the PLA to expand. Thanks a lot for the tips, Ill look into this further.....the shellac coating is a good idea. I will need a blowtorch _ i assume to melt the metal in the crucible? yet more things to buym the machine to spin as well as the gas and melting pot adn all the essential accesories. The neycraft one looks good. I wonder how I would do hollow models though as making pure copper solid heads would be expensive in the long run and needs far copper than a plate. I am currently experienting with patinas, So I will most likely get this machine, but for now Im learning how to make colourful patinas on copper plates without using heat as it would melt the PLA inside. Out of curiosity: if you cast larger pieces in bronze, do you cast a bronze shell only (=similar to "no infill" in 3D-printing)? Or do you cast them fully massive (=100% infill)? And if filled, do you have problems that the models crack due to uneven shrinking? I heard from an artist that this could sometimes be an issue in large models like statues. He made the clay models and silicone and plaster moulds (for the wax model), but he did not do the bronze casting himself, he went to a professional company for that. Some of his statues were 0.5 to 1 meter high. I have heard this as well. I saw a thing about making bells once and they said it was the most difficult part because of the cracking of the thick shell. I think 1 meter is something ill never do or at least not for a while. I think a few mm thick wall on a 20-30cm object would be ok though. But ill admit im just guessing. Printing a hollow model should be ok seeing as i never use infill anyway. Well rarely. For large pieces, you only cast a bronze shell, which is typically about 6mm thick. This usually means that you have to cut windows in the hollow wax to allow the investment to fill it, and use bronze pins to hold the interior investment in place when you burn out the wax. After you cast it, you weld the the windows back into the piece to make it appear solid, and then file and sand it smooth.